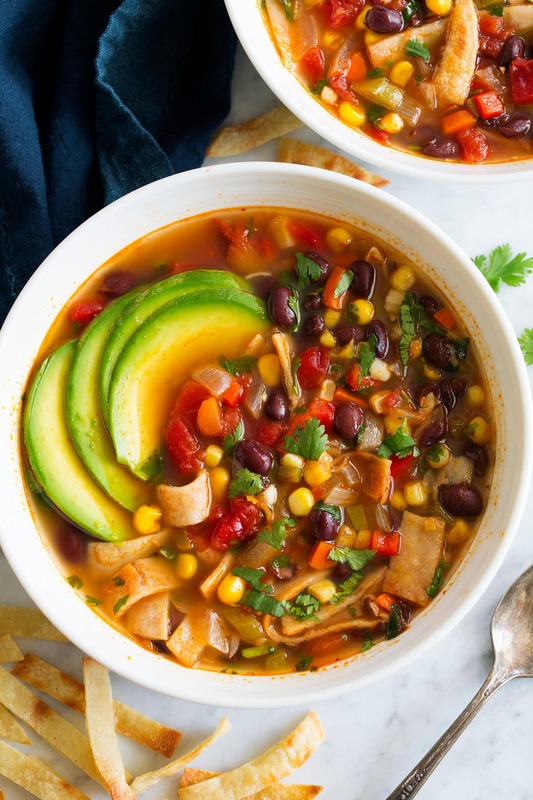 This vegetable packed Black Bean Tortilla Soup Recipe is a delicious year round soup that you’ll want to make again and again! 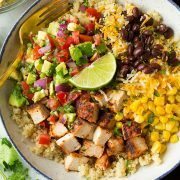 It’s a great way to get veggies into your diet and it’s layered with those delicious Mexican flavors we crave. Finish it off with queso fresco and sliced avocado for even more flavor. 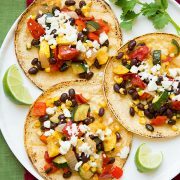 I may be a meat eater but I still love a good vegetarian black bean recipe. Black beans are a good way to protein and fiber in your diet plus I love the way they taste. And they’re all Mexican inspired recipes. So I guess we’ll keep that same good thing going here with this good for the soul soup. 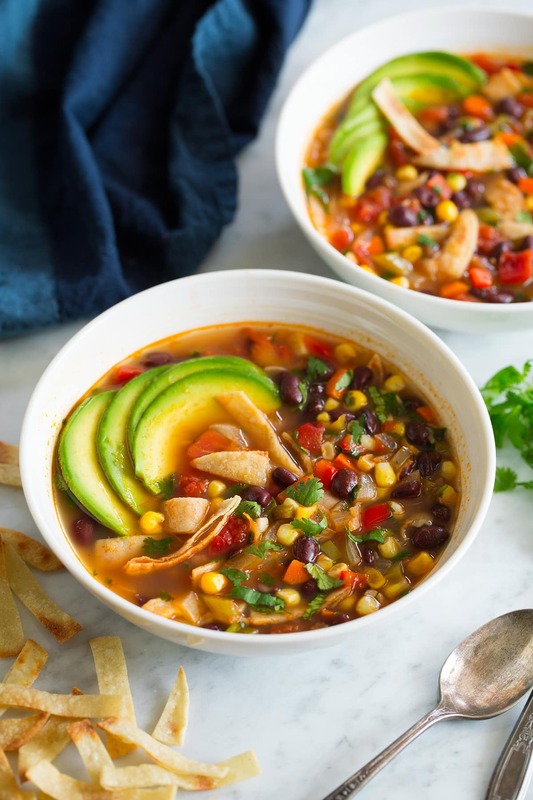 For this soup I like to make homemade baked tortilla strips but store-bought tortilla strips or even tortilla chips will work great as well. I like to make the tortilla strips while to soup is simmering. Start by preheating the oven to 375 degrees. Grease a baking sheet. Brush both sides of the tortillas with olive oil then place in stacks of four. Cut each stack through the middle (in half), then cut into small strips. Separate and spread onto prepared baking sheet into an even layer, season lightly with salt. Bake in preheated oven 6 minutes, remove toss then spread back out. Return to oven and bake until lightly golden brown and crisp, about 4 – 7 minutes longer (note they should crispen up even more as they cool). 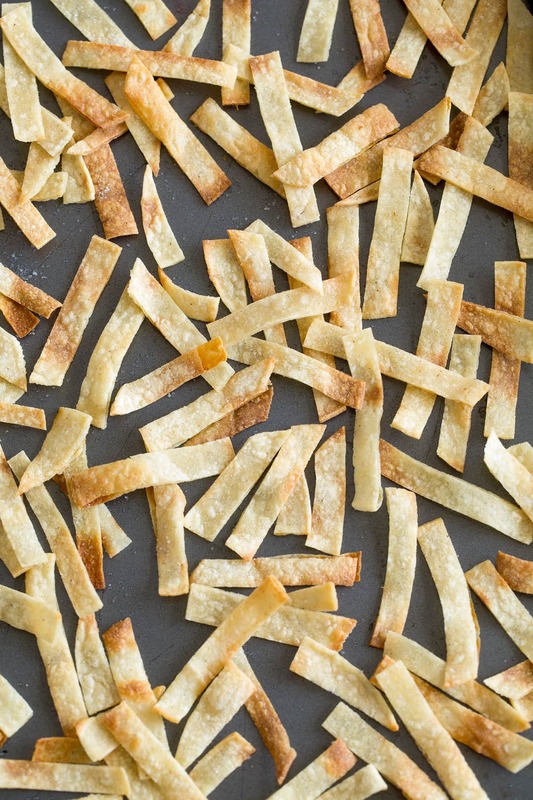 If going the homemade route, you can also fry the tortilla strips (instead of baking). To do so, pour vegetable oil into a pot until there’s nearly 1-inch. Heat oil to 370 degrees, then fry strips in batches until lightly golden brown and crisp. Using a skimmer transfer to a plate lined with paper towels to drain. Season lightly with salt. Then if you aren’t on a strict vegetarian diet, be sure to check out my chicken versions as well. 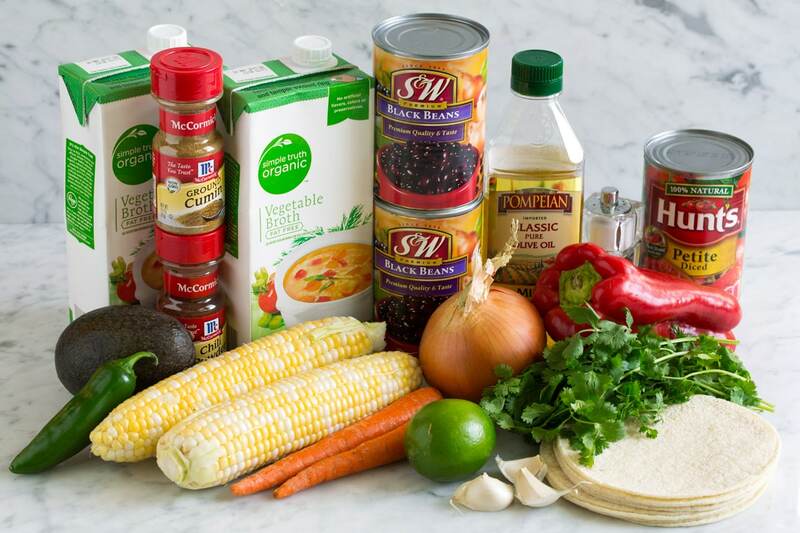 This is the veggie and black bean packed, vegetarian cousin of the traditional chicken tortilla soup. It's has great flavor and everyone will love the homemade tortilla strips! Heat 1 1/2 Tbsp olive oil in a large pot over medium-high heat. Add onion, bell pepper, carrot and jalapeno and saute 4 minutes, add galic and saute 1 minute longer. Pour in broth, tomatoes, corn, chili powder, cumin and season lightly with salt and pepper to taste. Bring to a boil then reduce heat to medium-low, cover and simmer 15 minutes. Add black beans and simmer 5 minutes longer. Stir in cilantro and lime juice. While soup is cooking brush sides of tortillas with the 1 1/2 Tbsp olive oil. 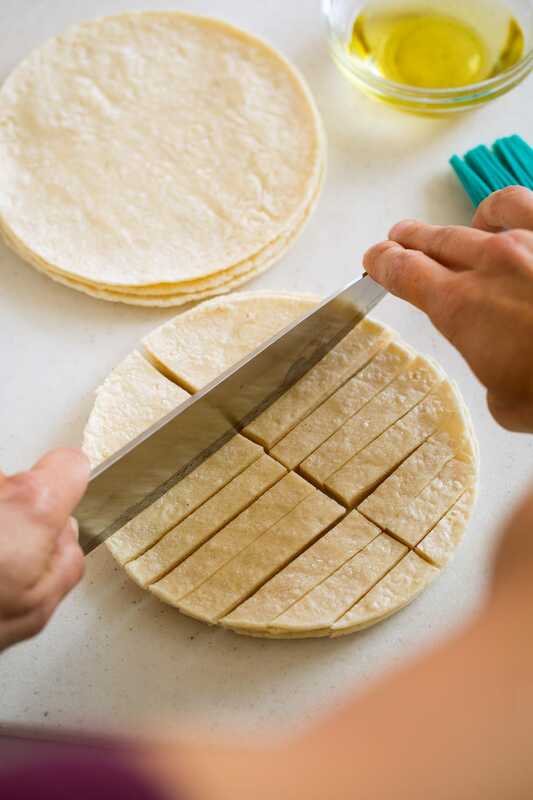 Then layer tortillas in stacks of 4 and cut each stack in half, then cut into small strips. Separate strips and spread onto a greased 18 by 13-inch rimmed baking sheet, working to place them in a single layer, season lightly with salt. Bake in preheated oven 6 minutes, toss then spread back out and bake 4 - 7 minutes longer until crisp. Let cool. 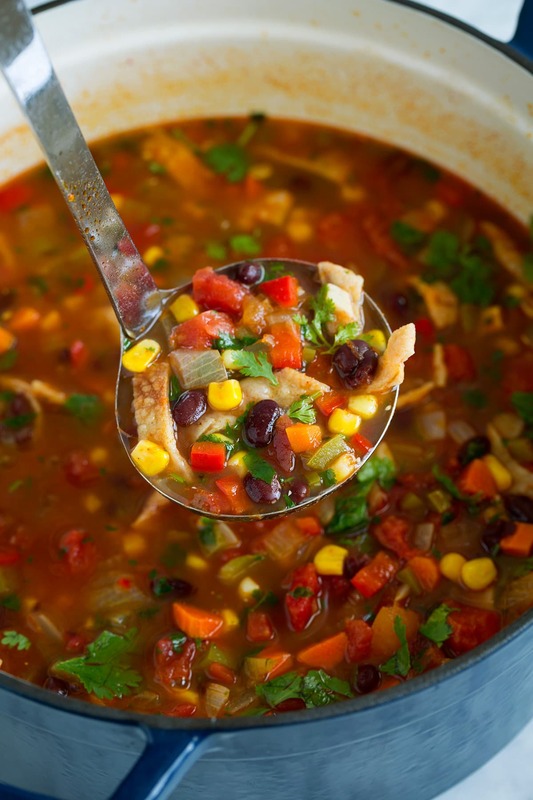 If serving all of the soup right away, stir half of the tortilla strips into soup (otherwise wait to stir strips in until reheating the soup). Serve soup with avocado slices, cheese if desired and more tortilla strips on top.